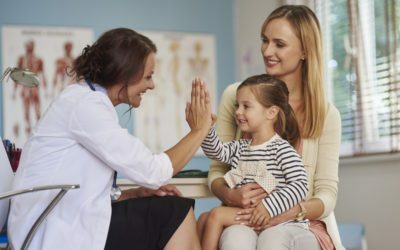 Parents are often overwhelmed when their child is diagnosed with Type 1 diabetes, an event that may come as part of a series of trips to the doctor or as a single unexpected trip to the emergency room. But if you find yourself in this situation, know that you are not alone and that there are steps you can take to help your child cope — and thrive — with the condition. Learn more in this parent’s guide to the Type 1 diabetes diagnosis in kids. Children with Type 1 diabetes often have a gene that tells the immune system to destroy the cells that produce insulin. When a child’s body attacks the insulin-producing cells in the pancreas, the immune system destroys the cells as if they were an infection. When this happens, the child’s body no longer will produce insulin, the hormone that carries blood sugar to the cells. Children become sick because their levels of blood sugar, or glucose, get too high. Glucose is their body’s fuel, giving them energy and keeping all their organs working. Glucose comes from the food they eat. A child’s blood delivers glucose to every cell in the body, but it needs insulin to help deliver it to the cells. Children with Type 1 diabetes are not making enough insulin in their pancreases, so glucose cannot get to their cells. Instead, the glucose stays in their bloodstream. When children have high sugar levels, it is because the glucose consumed has not been carried to their cells by insulin. The symptoms of the condition can take a long time to develop and can mimic other diseases. Urinating frequently, abnormal thirst, increased appetite without weight gain, and tiredness are typical symptoms. However, there can be other signs that something is wrong, such as bed-wetting, a vaginal yeast infection in prepubescent girls, stomach pain, nausea, vomiting, and fruity-smelling breath. Clinicians and caregivers sometimes mistake these symptoms for the flu or appendicitis when, in fact, the child may have a serious condition: diabetic ketoacidosis, or DKA. Many children with Type 1 diabetes will need insulin for their entire lives to prevent blood sugar, or glucose, from reaching levels that can damage tissues and possibly threaten their lives. Unfortunately, the number of children with Type 1 diabetes is increasing. Every year, roughly 18,000 children are diagnosed with Type 1 diabetes. Researchers and doctors cannot explain this rise in the number of cases; however, some studies have suggested causes unrelated to genetics. Researchers also are working to develop a genetic test to determine whether people are at risk for Type 1 diabetes. Promising research has shown it may be possible to replace the gene that attacks the insulin-producing cells using gene therapy. An important conversation has started about whether the term juvenile diabetes still should be used interchangeably with the term Type 1 diabetes, since Type 1 diabetes also can develop in adults. Negative associations with Type 2 diabetes in adults, such as overeating and lack of exercise, have caused some confusion and perhaps some stigma for adults with Type 1 diabetes. When children are diagnosed with Type 1 diabetes, they may feel they have done something wrong. Parents and other caregivers may think there was something they could have done to prevent the diagnosis. It is important to help your child understand that having Type 1 diabetes has nothing to do with diet or lifestyle. It also is important to reassure your child that there was nothing that could have been done to prevent the development of Type 1 diabetes. Your child may ask if diabetes will ever go away, like a tummy ache or a cold goes away. Unfortunately, the answer is no. To help your child feel hopeful, you could share information about the many people working to find a cure for Type 1 diabetes. Make sure your child knows that until there is a cure, you will help him or her learn how to live with Type 1 diabetes and continue to do the things he (or she) likes to do. Why does my child need insulin? Your child will need to take insulin to help his cells work the way in which they are supposed to. In addition, you will need to help your child eat a careful diet, stay active, and monitor blood pressure. It will take a lot of patience and care to help your child manage Type 1 diabetes and maintain his blood sugar balance. If your child has too much sugar, he can become hyperglycemic, feeling tired, weak, confused, irritable, shaky, and very hungry. Too little blood sugar can make him or her become hypoglycemic, feeling dizzy and possibly passing out. • be monitored for signs of diabetes complications and other health problems that occur more frequently in kids with Type 1 diabetes. Children may not understand why they need to take blood samples and inject insulin. They may be uncooperative and upset; some may even experience so much frustration that it becomes anger. This is normal. It is important to help your child understand that you are a team working together to treat diabetes and that it’s OK to ask for help. Caring for a child with Type 1 diabetes may seem overwhelming at times, but you are not alone. When your child is frustrated or not cooperating with self-care, ask your child’s diabetes care team for help. The team can connect you with resources to help with blood sugar control and medical issues. The diabetes care team also is there for you, as the caregiver, to teach you how to help both your child and you live with diabetes.